I get really excited when I find a new kids’ company that gets it…really gets it. Barley and Birch is one of those companies! Barley & birch is a scientist-created and artist-designed children’s clothing line. All aspects of our business are carbon neutral, including everything from the energy used by our computers to the energy used in the production of our garments. All of our pieces are made in the U.S. by using 100% certified organic cotton. Our business is largely paperless, and all paper used is 100% recycled. We go beyond the level of convenience in order to be fair to our customers and to our planet. Not only is Barely and Birch a green company, but their designs are so cool! My son is the typical boy interested trucks, bridges, trains, etc. He absolutely adores his Barley and Birch Bridge t-shirt (is it the Golden Gate? ), and of course, I love that it is organic! It is much more aesthetically pleasing than the typical boy dump truck shirts. Barley & birch was created with the twin goals of making organic clothing just a little hipper looking and a lot better for the planet. Kyle, barley & birch’s creator, was inspired to create barley & birch after her lengthy research into true nature of several prominent ‘organic’ children’s clothing lines. She was shocked by everything from the overseas production facilities to the harsh chemicals used in the printing. Jodie, the lead designer, was determined to give nature, and its animals, a cooler face than those she saw everywhere else. Barely and Birch is also a socially responsible company, and again, THEY GET IT! Kids get dibs on the future. Let’s give them a good one. Imagine you’re a kid. Your whole life’s in front of you. But so are melting ice caps, shrinking rain forests, and all kinds of other bad-dreamy things. No fair! 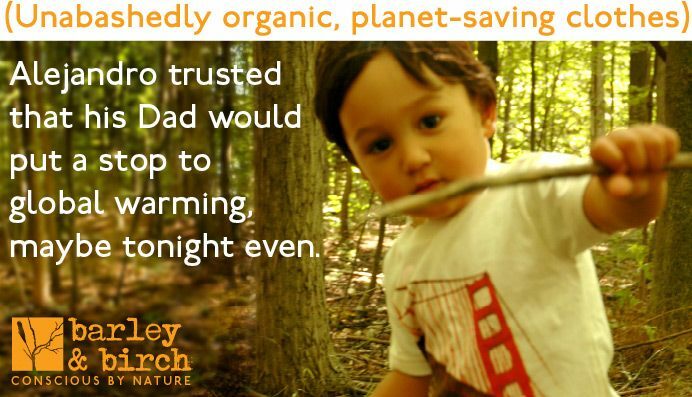 Kids need clothes, but they also need a healthy abundant world. Barley & birch was created to give them both. Our shirts, onesies, pants and hats are made in the USA using 100% certified organic cotton and water-based inks. (They don’t pollute the earth, water, or expose farm workers to toxins.) Also, at least 15% of our profits go to several carbon-reducing initiatives in order to fully offset the carbon emissions that result from the production of our garments. And at least another 15% goes to organizations that improve people’s lives around the world. From tank tops to onesies, you won’t be disappointed with Barley and Birch’s clothing line. The company motto is “Conscious by Nature”, and it is clear this motto drives all the company’s decisions. You can purchase Barley and Birch goods at Eco Conscious Market, where 10% of your purchase is donated to an organization of your choice. We LOVE Barley & Birch, they employ such wonderful values and ecoethics… not to mention the fantastic style, the poppy & cactus prints have gathered quite a following! They very fine range of clothing .